Which ShoulderSphere is For You? For the serious competitive athlete who needs not just power, but power with control. 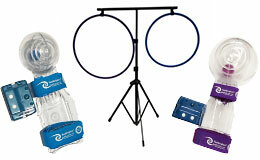 The personalized and collapsible Coaching Rings are easily portable in gym bags. This attractive and ergonomically designed accessory ensures an amazing and disciplined workout anywhere for a highly focused exercise that trains your shoulder for both power and control. This is the high intensity interval training (HIIT) for your rotator cuff muscles. Dynamically move the arm while spinning the ball to pass through the Coaching Rings requires intense focus and power with control. A great training tool for those movements during competition that require concentration, power, and control. The Purple Ring is entry level ; while the Blue Ring is a challenge! Pass through the Ring back and forth for 20 reps equals a one minute workout with high focused intensity! In order to pass through the Blue Ring with the A7 model, the user must have the power equivalent in the shoulder as behind a 90 mph baseball pitch, or a 25 mph heavyweight boxer’s punch. A must have for any serious athlete! F2 model passing through the Blue Ring equates to the power behind throwing a tennis ball at 60 mph from baseline to the tennis net.